Really good matzo ball soup is really and truly one of my favorite foods ever. But here’s the deal- NOBODY IN THE STATE OF TEXAS SEEMS TO WANT TO SELL IT, so I only enjoy it once a year during Passover time. 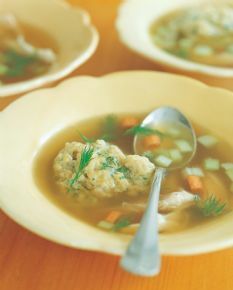 When I inquired to my mom about the soup this last Passover, she told me it wasn’t hard to make, just time consuming, which is why she only makes it once a year (and it should be said she makes it for about 30 people for the first seder). So I made it my mission. Homemade chicken stock is so astronomically better than boxed stock, it’s almost a crime that boxed is even sold. Ina says it all the time, but it’s TRUE. There’s something so satisfying about watching a huge pot of herbs and vegetables and chicken simmer over hours and hours with the house smelling so good. The only downside of this process was handling the raw chickens, which I still can’t deal with maturely. But otherwise, this was such a satisfying thing to make and eat (even on a 105 degree day). It was fun eating it without matzo and saltwater-dipped parsley and charoset. It was fun just eating it on a normal day. The photos of this soup were deleted in a tragic accident and were not able to be salvaged. 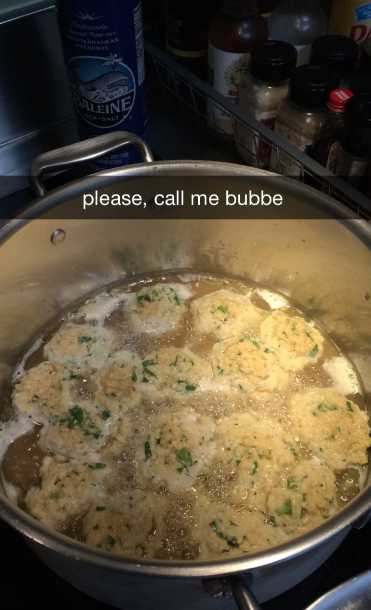 What I do have is this braggadocious Snapchat of the matzo balls cooking. The smells happening in this kitchen, man….the smells. This photo thing might be a blessing in disguise, as matzo ball soup could be one of the most unphotogenic dishes I’ve ever made or eaten. Here’s a picture of Ina’s looking about as good as it can. Next Next post: another french meal?